MiSTer: MiST on Terasic DE10-nano board. Re: MiSTer: MiST on Terasic DE10-nano board. Sorgelig wrote: New core: ao486 just released! Thank you so much, this is amazing news! Each board was soldered by hand and successfully tested with sorgelig's memtest at 140MHz for 30 minutes. I'll take 20€ per board + shipping cost. payment can be paypal or bank transfer. please send an email or PM if interested. Last edited by gagadagatika on Sun Aug 06, 2017 12:50 am, edited 11 times in total. VGA controller in ao486 has some problem which produces some garbage on screen in Windows 95 (and may be other apps/games in DOS). I've succeeded to fix this. Will release new version soon. 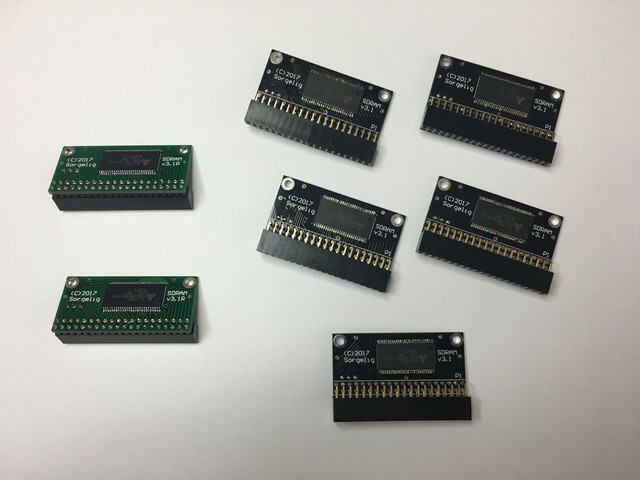 Great to see more SDRAM boards being build! For easier 2x20 connector soldering i recommend to cut the pins all the way when PCB is inserted and then solder it. Originally i've cut it with leaving around ~0.5/1mm on top of board, but later discovered that fully cut pins can be soldered much easier. Just ordered a de10 from digikey. I should receive it in a couple of weeks. gagadagatika wrote: I was unfortunatly not foresighted enough to order enough chips in the beginning, so i had to reorder them. If everything is ordered at one distributor and at one PCB manufactor, then the price can be pushed further down. 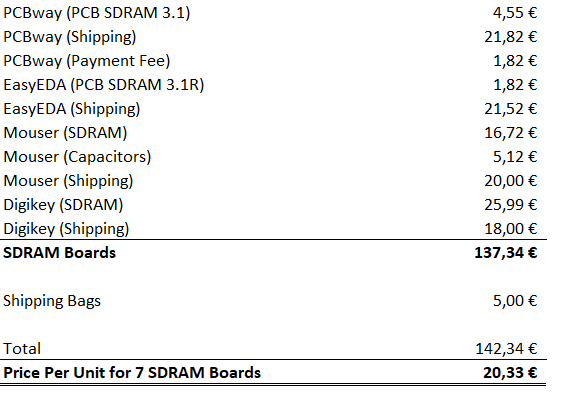 Just FYI - price on PCBWay is similar for 5 and 10 units. I've got 10 boards each (I/O expansion and memory extension) for $5 + $5. Plus $15 delivery to the US. So total $25 for 10 pairs of boards. In fact I've got 12 boards each, cause PCBWay is very generous and if there is a spare place on a panel - they replicate design until fully populated. So logistics can be optimized for PCB production. Mouser is the cheapest source of 166MHz memory chips (in fact they work just fine up to 150MHz on DE10-Nano GPIO connector). Farnell has cheapest SMD resistors/capacitors. Most of positions can be found with huge discounts (like 1000 resistors for $2, or 1000 capacitors 0805 size for $4). Connectors - AliExpress. In release ao486_20170805 the screen starts rolling (HDMI out). Rolling gets worse as the system is running until everything is unreadable. I know the core is unfinished, but I find it hard to get files copied over. Is there a way to get a second hard drive accessible (like with the Minimig Cores) or a CD-ROM? What is the best option? I do not know how to get VHDs mounted writable in any other system (esp. VHD with MBRs and FAT16). some releases have more chances to have visual rolling (VGA scaling is still cumbersome). But if you make 1-2 cold reboots for DE10-Nano (power off + power on), then you can get picture without issues. For now we didn't find any easy way to emulate CDROM, so that will be not an option for a long time. Single HDD image supported. You can just create empty file with required size (1Gb hdd.vhd full of zeroes for instance), copy it to SD card and set as HDD image for ao486 core. Then boot from floppy image, run fdisk, format it (yes, I love to type "format c:" ) and you have proper disk image with MBR and partition(s). There are many tools that work with such disk images, just rename the extension to .img while working with them on PC. I use PowerISO. But most of *image or *iso tools support such raw images. Last edited by Sorgelig on Sun Aug 06, 2017 10:46 am, edited 1 time in total. into ao486 directory (where are your vhd files). - navigate to /media/fat/ao486 and there execute ./vmount hdd.vhd where hdd.vhd is your VHD. - now you can navigate to /media/rootfs and find the files from VHD there. You can read/write/delete whatever you want there. There is one important note: When you finish, you need to un-mount it. The easier and safe way is to press LShift-LCtrl-LAlt-RAlt combination of keyboard attached to DE10 (not on PC keyboard). If will flush the cache and reboot DE10. Do not press reset button - it may corrupt your VHD. Don't run ao486 before un-mounting the VHD. You may connect to DE10 by SFTP instead of SSH. It supports SSH commands and support the file copying. The best SFTP client from my point of view is Total Commander. You can issue vmount command directly from TC's command prompt. Well first thing thanks to Sorgelig for your awesome work ! On the PCB scheme i see 3 ranges of 20 pin connectors but on the image of the board, i only see two, is it normal ? Last question, if i choose to mount the pcb verically, does someone has an idea of the pin header to choose from digikey ( like these one : http://www.digikey.fr/scripts/DkSearch/dksus.dll?Detail&itemSeq=235090053&uq=636375448813915860 and http://www.digikey.fr/scripts/DkSearch/dksus.dll?Detail&itemSeq=235090089&uq=636375448813915860) ? Last edited by mggk on Sat Aug 05, 2017 9:49 pm, edited 1 time in total. Exactly what I was looking for! SSH and FTP should work so much better for me. I will give it a shot. Thank you! Sorry I did not see that you posted a new ao486 release. I will test it tomorrow. Anyhow, using release 0803 your procedure to mount the VHD and use FTP worked perfectly. Again thank you. Now I could bulk transfer all my files. Played a bit EPIC Pinball and Lotus III. Too bad joystick is not emulated yet - guess that is a bit harder, as most PCs had their joystick ports on the soundcard or on extra boards. Look really great. I find that the cursor keys of the keyboard are not always registering. Instead it looks like sometimes the function keys are registered, when arrow down is pressed. I noted this in Norton Commander 5. Not a stupid question at all! I have build all three versions of the Board now. The only major difference that I have found is, that the horizontal versions pass the 150 MHz memtest much easier than the vertical ones. I managed to build only one vertical one that passes a 150 MHz long time test while all horizontal ones pass the test. The reverse version blocks the arduino header next to the sdram Board. You need a 2x20 (40 position) female connection header. It's always two rows, but depending on the version you choose to build, you have to choose between two different rows on the board. mggk wrote: On the PCB scheme i see 3 ranges of 20 pin connectors but on the image of the board, i only see two, is it normal ? images are from older version. Universal version has 3 rows because different mounts use different rows. You can refer silk layer box outline. It shows which 2 rows used on each side. Although vertical mounting has lower upper frequency, it's enough to pass at least 140MHz test. Horizontal inward direction blocks the Arduino GPIO and will prevent future expansions. Vertical mount is kind of ideal if vertical dimension doesn't matter. Vertical mount uses upper 2 rows. Your links doesn't open specific item but some search results. NegSol wrote: Sorry I did not see that you posted a new ao486 release. I will test it tomorrow. scrap that, it still glitches. I tested the this release with my installation. HDMI output is rock solid with this one now. However, my DOS 6.22 installation is not loading correctly. EMM386 is bailing out with random errors or just halting the system. Without EMM386 DOS sometimes boots, but no other program starts. Release 0803 still works best. Cheers! Sorgelig wrote: Your links doesn't open specific item but some search results. NegSol wrote: I tested the this release with my installation. HDMI output is rock solid with this one now. However, my DOS 6.22 installation is not loading correctly. EMM386 is bailing out with random errors or just halting the system. Without EMM386 DOS sometimes boots, but no other program starts. yep, i also found problem with last build. Big cores tend to have stability problem between build. I will try to make the good one.